The driver of this vehicle crashed into a light pole in front of Maria’s at East Main and Bennett streets Saturday. A Grass Valley woman with two prior DUI arrests this fall ended up in jail again after reportedly crashing into a light pole while driving drunk. 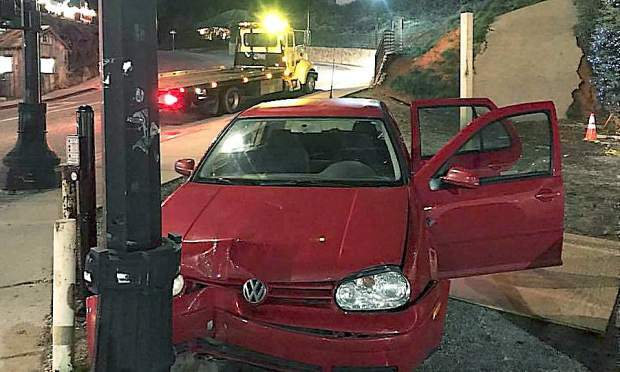 At about 8:15 p.m. Saturday, the driver narrowly missed pedestrians and multiple parked vehicles when she careened off the road, according to the Grass Valley Police Department, which posted photos on its Facebook page. Witness said the woman was driving on Richardson Street toward East Main Street when she failed to negotiate the curve in the road, said Officer Jesse Cloyd. The woman then crashed her Volkswagen Golf into a light pole in front of Maria’s at East Main and Richardson streets, Cloyd said. She was identified by witnesses at the scene, and detained by officers trying to leave the scene on foot while on the phone arranging a ride to come pick her up, police said. Ashley Marie Parker, 35, refused to take a field sobriety test, Cloyd said. She was arrested on suspicion of driving under the influence, as well as an outstanding warrant, and was booked into county jail and released on $10,000 bail. According to court records, Parker was already facing charges of driving under the influence, driving with a blood alcohol content of 0.08 percent or higher and driving with an open container, in connection with an arrest on Sept. 2 by the California Highway Patrol. She is scheduled to enter a plea in that case on Jan. 24. Parker also has a case from Sept. 26 in which she was charged with driving under the influence. She was cited and failed to appear in court Dec. 15, and an arrest warrant was subsequently issued, according to court records.